Marlene ‘Mo’ Morris’ documentary, A New Color, reflects the joy, aliveness, and love that pour out of the film’s subject—artist, activist, educator, great grandmother, and muralist Edythe (Edy) Boone. Morris follows Boone through the many facets of her non-stop creative life. In just 57 minutes we are recipients of Boone’s aforementioned joy, aliveness, love—and wisdom. Using art and her awe-inspiring internal resources, Boone has provided a lifetime of service to under-served populations of young people and seniors, and she’s still at it! 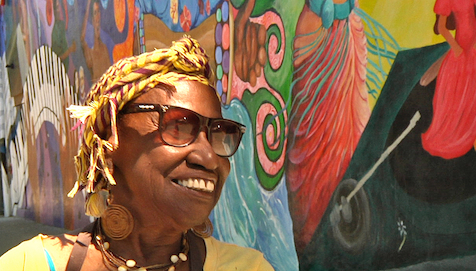 A prolific self-taught artist, Boone left Harlem in 1978, when crack cocaine took hold of her neighborhood. She settled down in the San Francisco Bay Area which has been a fertile field for the blossoming of her many-faceted contributions to this region—and now the world. The film does not ignore life’s sadness and tragedies. The senseless killing of Eric Garner, Boone’s nephew, by New York police serves as a reminder of continued, deeply entrenched racism in American society. Multiple viewings of A New Color are inevitable. Go to the website to learn more about the film, of course. Note that at the home page, below the banner image at the top, are screenshots from the film. These photos are also hotlinks to other parts of the website. A New Color is that rare documentary film that I simply did not want to end. This entry was posted in Don Schwartz Spotlight on Documentaries by Don Schwartz. Bookmark the permalink.